Ford Motor Company is the first automaker to work with Gravity Sketch, a 3D virtual reality tool which enables designers to create more human-centric designs. This new creative tool will enable Ford designers to place the customer at the center of the development process throughout the creation process of a new vehicle. This new Ford design team experiment with Gravity Sketch could help to transform its base in Dearborn into a virtual reality environment for a more customer-focused approach in the future. With the help of Gravity Sketch, the man in these photos is designing a virtual car around himself and adjusting the attributes to best suit him, the driver. Designers will now trade in their sketchpads for a headset and controllers to become immersed in virtual reality, and imitate gestural interactions through motion tracking that will replicate sketching a design with a pen and paper. 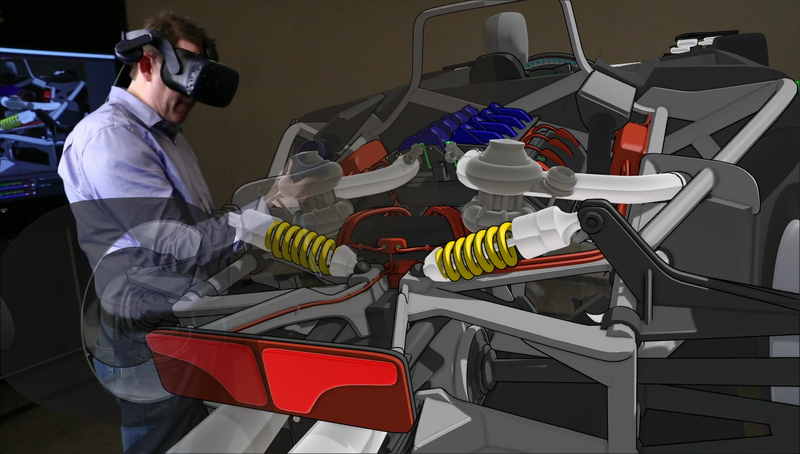 “Jumping right into 3D gives us a 360-degree view of a vehicle as it is being created,” said Michael Smith, Ford design manager. Smith said that seeing all angles of a vehicle as it is being drawn truly unleashes creativity and fosters development of human-centric design from start to finish. This new strategy with Gravity Sketch is very different from traditional automotive design. Old school design begins with a 2D sketch which is scanned into a high-quality illustration. Those renderings are evaluated, and a few are translated into data using computer-aided design software to create a 3D model. That model is then transferred into a virtual reality environment for further evaluation to determine the design’s feasibility. This old school process can take weeks, which forces designers to be extremely selective about which designs they choose to send off to the 3D modeling stage. Gravity Sketch allows designers to speed the process from weeks to hours, and skip past the 2D stage. Designers are able to anchor a driver at the center, and rotate their 3D design to view it from any angle in order to create a scalable vehicle around their virtual driver. Designers can even step inside the vehicle sketch to quickly adjust design attributes to best suit drivers and passengers. Gravity Sketch enables Ford designers to place the customer where they belong–at the center of the vehicle. For more Ford related tech news like this, subscribe to Ford Authority.